The spirits I keep around the house are not generally from the East Coast. I’ve always thought the East Coast was a great place for seafood, hiking and small liberal arts colleges but vodka? Not so much. But with a little searching, I came across a delicious vodka made right in the heart of lobstah country, Maine. No, it’s not exactly in my back yard (though in the 18 years I lived in NH, it certainly was) but it didn’t travel anywhere near as far as the vodka I usually drink travels nor did it have a decades-long print ad campaign associated with it. The vodka is called Cold River and it’s based in Freeport, Maine. The distillery is a one building operation and makes a nice stop on the way to look at insulated socks at the LL Bean flagship store nearby. What we do have here right now are cucumbers. Lots of cucumbers. They are crisp and clean tasting which is exactly the way I would describe Cold River’s excellent vodka. Just as the vodka is cleaner and more interesting than the well stuff that many of us had during college, local cucumbers are bursting with flavor that just can’t be matched by their supermarket counterparts. I add a little citrus and some local honey or sugar and I’m good to go. 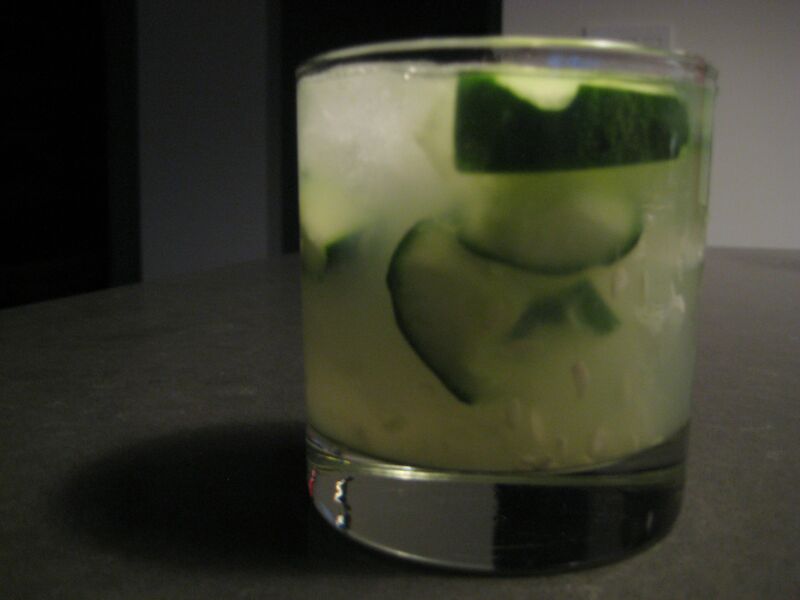 I will add ‘Cucumber Cooler’ to the long list of things that the East Coast is good for. Oh yeah, and those insulated socks. They really do work.